Not quite two weeks ago, Miss T, the older sister of Miss M, fell at school while playing a game of bullrush. 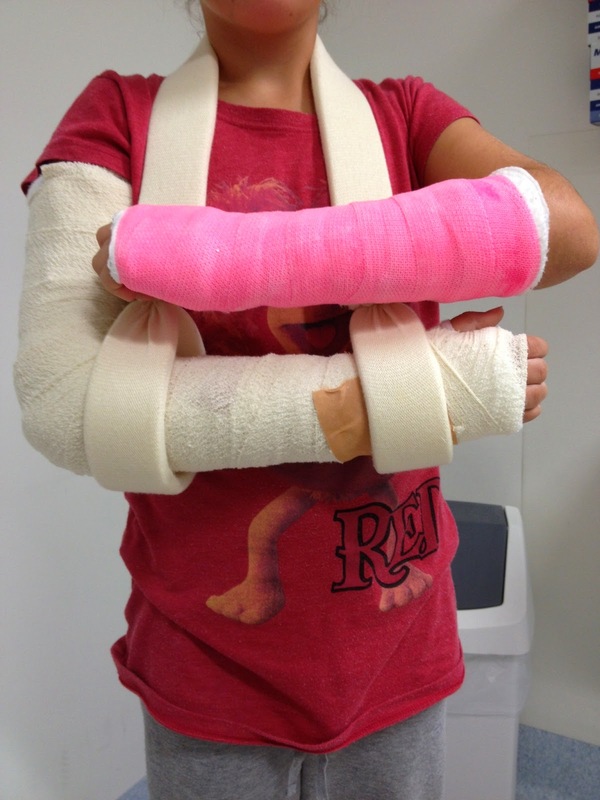 She now has a greenstick fracture of the left wrist and as the swelling had subsided, a pink fibreglass cast was put on the wrist on Monday. That night, she went to a girls club which she has attended for years. She loves it there. DIL was horrified to be called and told that Miss T had fallen and hurt her arm. Apparently the girls were plying leapfrog and using a small trampoline as a springboard. The leader at the trampoline questioned her because of the cast but allowed her to proceed. The inevitable happened and she fell again. The arm is very swollen and there are marks on the x-rays which suggest a possible break ten centimetres below the elbow and another in a similar position above the elbow. When the swelling goes down, the diagnosis will be clearer. DIL has more than enough to do ferrying Miss M to chemo, kidney tests etc., without having to fuss over her big sister. What about eating? And as practically everyone has said who has seen the photo, what about the bathroom? I have written to the state secretary of the organisation to say that duty of care and safety trumps being popular every time. That leader should have made it plain that Miss T should not be anywhere near the trampoline, not matter how much she wanted to jump. No, that is the worst luck, to have two incapacitated arms. And yes, that is a total lack of professionalism and duty of care. Knuckles should be rapped and then battered.